Homeikan Ryokan – if you’re looking for something traditional, try a Japanese ryokan! At Homeikan you’ll find traditional straw mats, homemade meals, and a communal bathhouse. Accommodations are basic, but the experience is memorable. Hotel Niwa Tokyo – simple and quiet, Hotel Niwa is a great option for those who want to be centrally located within the city with western accommodations. Hotel Blossom Shinjuku – this hotel is conveniently located in the middle of Shinjuku, one of my favorite neighborhoods of Tokyo. 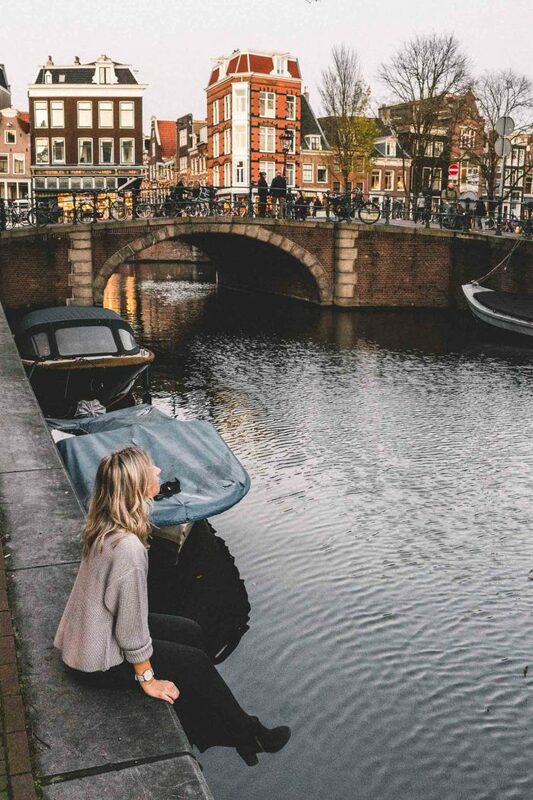 It’s one of the more affordable hotels in the city and just a 3 minute walk from the train station. 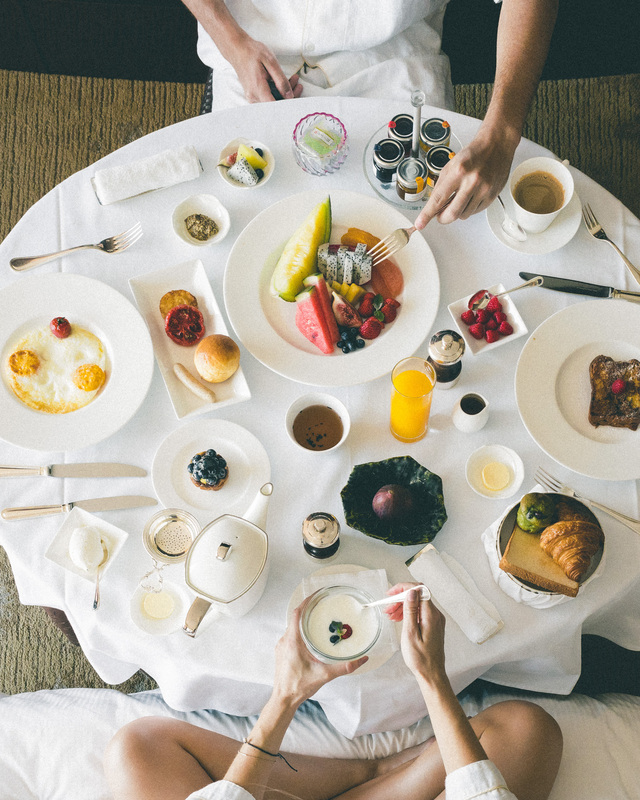 Hotel Metropolitan Tokyo Marunouchi – an upscale hotel nearby Tokyo Station, Hotel Metropolitan has all the modern comfort you need plus a panoramic view of the city from their high rise bar and restaurant. 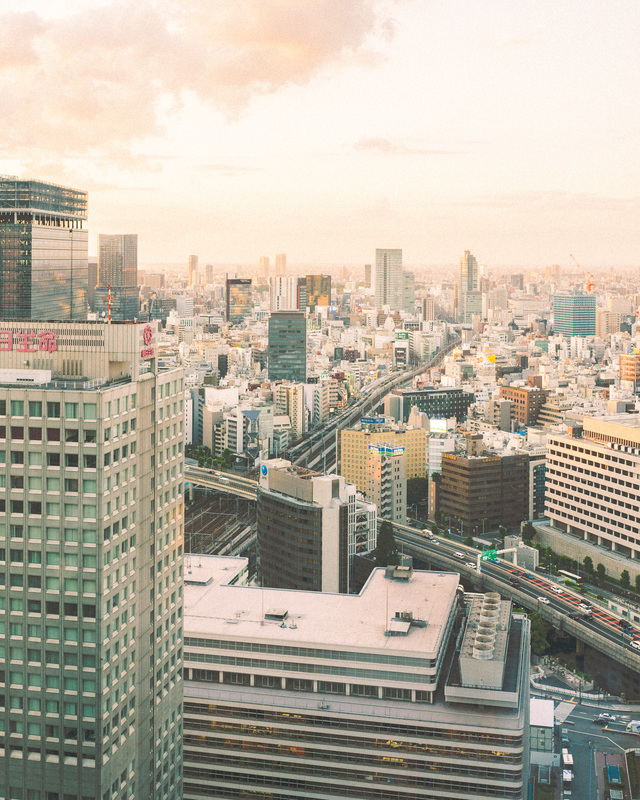 Shangri-La Hotel Tokyo – perched on the 28th floor overlooking Tokyo Station, the Shangri-La Tokyo is a welcome escape. Featuring world-class restaurants, a Tibetan-inspired spa, and lavish rooms with a view, the hotel’s attention to detail is unlike anywhere I’ve ever stayed. Park Hyatt Tokyo – made famous by the movie “Lost in Translation”, the Park Hyatt Tokyo features 360 views of the Tokyo Skyline and Mt. Fuji. Golden Gai – this charming collection of tiny bars in the middle of Tokyo’s tall buildings serves drinks late into the night. Think 6-8 seats, cozy interiors, and visitors from all around the world. Note: some bars charge a cover, so check the signs posted outside the door before sitting down. 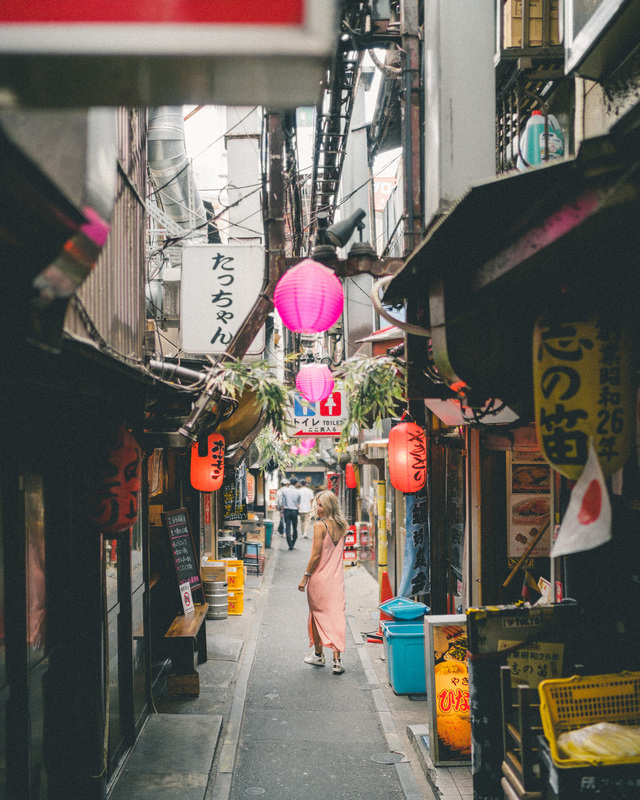 Omoide Yokocho or “Piss Alley” – don’t be deterred by the name – this tiny alley featuring walk up street food restaurants and bars will make you feel like you’re stepping back in time into another era of Tokyo. Arty Farty – for cheap drinks and an all around fun vibe, visit this dance club in the center of Tokyo’s gay scene (all visitors welcome). We had the best time here! 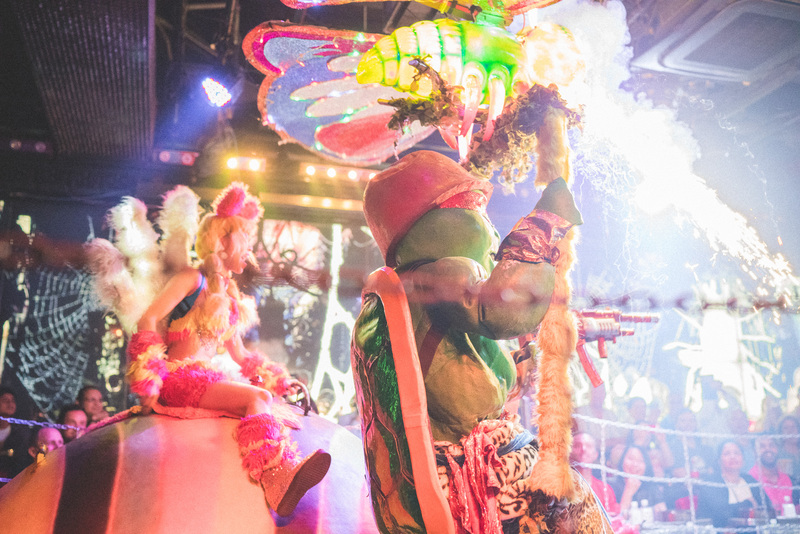 Robot Restaurant – this show came highly recommended, and in terms of a “crazy Tokyo experience”, it can’t be beat. Prepare yourself for dancers, robots, elaborate costumes, and much more…don’t try and make sense of it, and you’ll be just fine. Book tickets in advance via Viator. Don Quixote – this store is kitschy and so fun. You’ll find everything from socks, to costumes, to food and designer suits. I walked away with a bag full of gifts for friends and family. Local’s Sushi Joint – if you want something truly authentic, visit this restaurant and order the Takamaru, below. 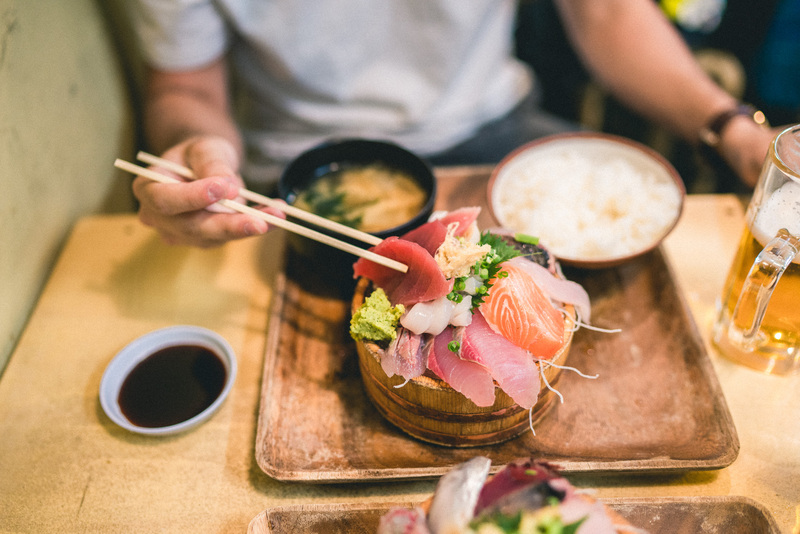 Nothing is in English, but you’ll have one of the cheapest meals in Tokyo. 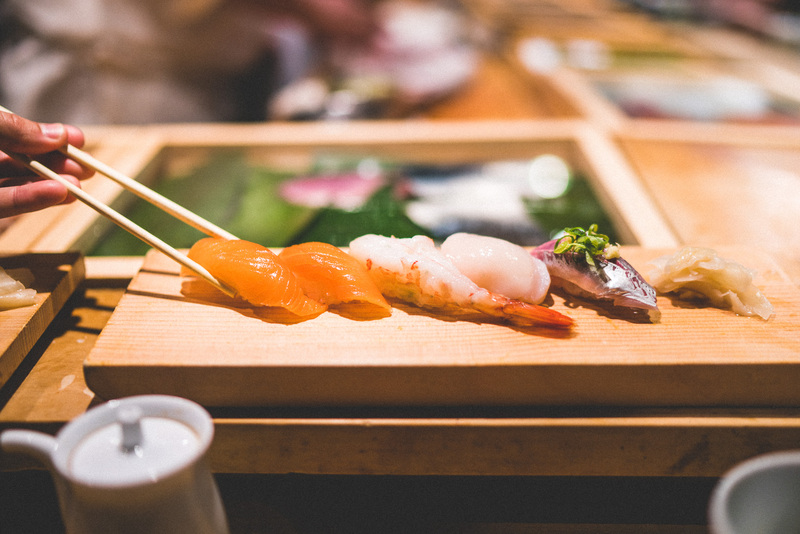 Numazuko – this rotating sushi bar near the center of Shinjuku was one of my favorite spots to fill up on fresh sushi for a reasonable price. Kagurazaka District – we stumbled upon this French quarter of Tokyo one afternoon, and it’s totally unique! From shops to restaurants to Parisian cafes, it’s a great place to people-watch and explore. Cat Cafe MoCHA – coffee, cats, and coziness. This is one of Tokyo’s famous cat cafes, and if you’re looking for a unique experience alongside some furry friends, look no further. Shibuya Crossing – this is the famous busy intersection that’s featured in movies – it’s quintessential Tokyo! My tip: grab a coffee at the Starbucks overlooking the intersection and enjoy the rush. 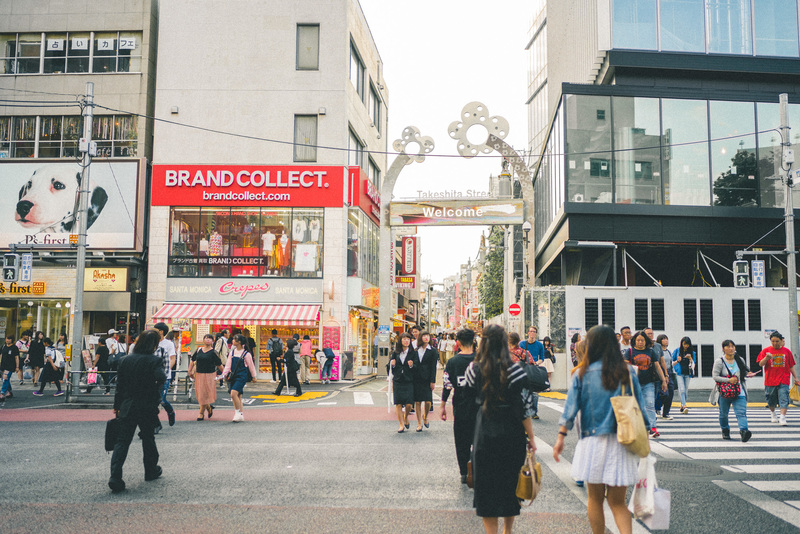 Takeshita Street – this shopping street is the epitome of Kawaii (cute) Japanese culture! 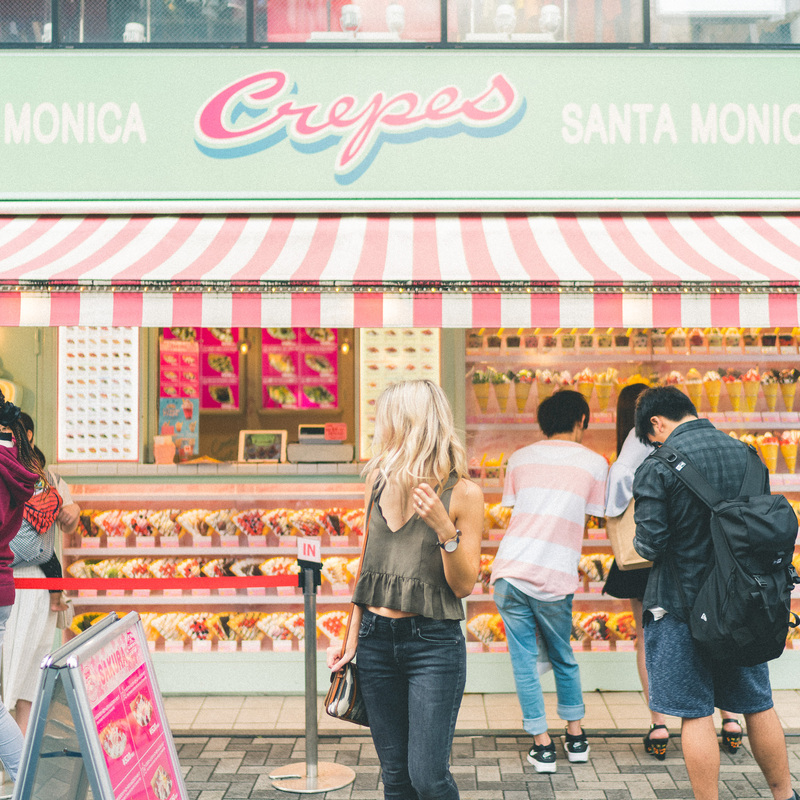 It’s lined with Japanese boutiques, dessert shops, and fun restaurants. Harajuku – the area across from Takeshita Street was my favorite in the city. 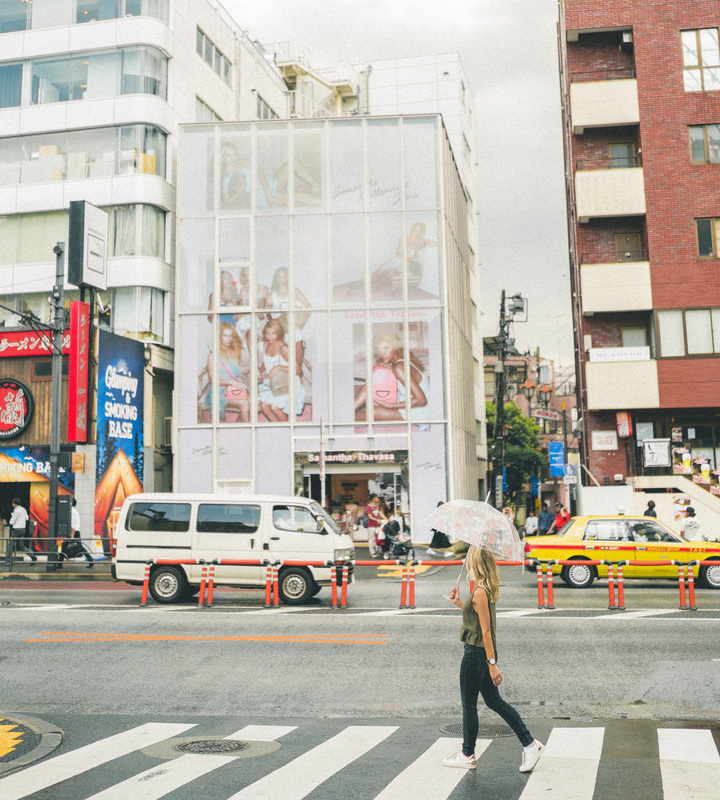 I’d suggest mapping the Supreme Store in Harajuku and just wandering from there; you’ll find vintage stores, trendy coffee shops, and the coolest boutiques around this neighborhood! Kawaii Monster Cafe – stepping into this restaurant is an experience in itself. 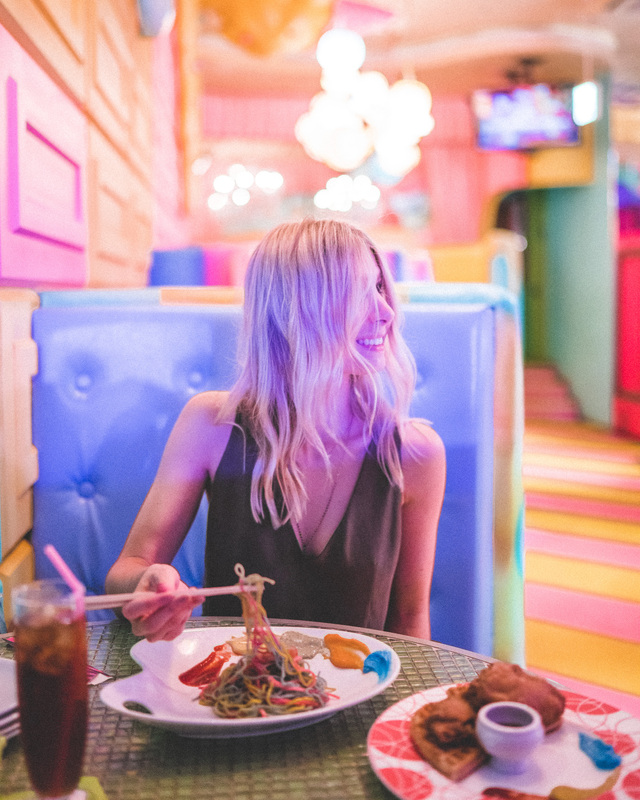 Every room has a different theme, and ordering off the menu will feel like you’ve reverted back to your childhood. My rainbow pasta speaks for itself. Lunch at Kawaii Monster Café. Every room has a different theme! Ichiran Shibuya – this local ramen chain is a favorite amongst locals and visitors alike. You’ll order from a vending machine when you walk in and then be seated in your own individual stall so you can fully experience the flavor of your ramen bowl. And it’s delicious. Imperial Palace – the gardens are open to the public at this historic palace every day except Monday and Friday. An afternoon exploring the grounds, which feature moats and beautiful Japanese architecture, is a perfect escape from Tokyo’s main streets. Hie Shrine – this old shrine is a welcome oasis in the middle of the city. Don’t miss the Tori Shrine, which is reminiscent of the famous walking path at Kyoto’s Fushimi Inari Shrine. 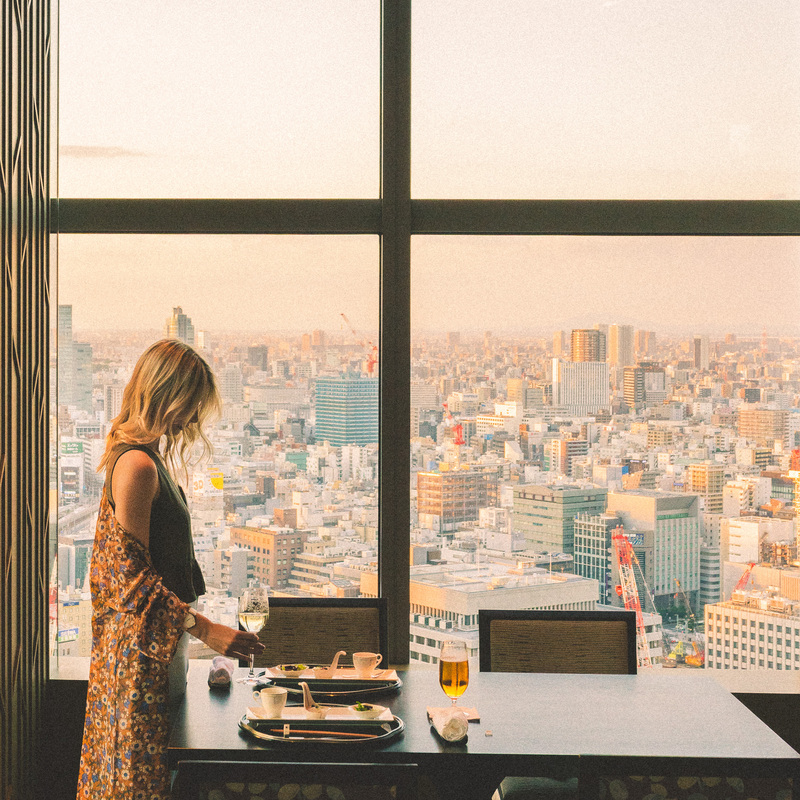 Nadaman – if you’re looking to splurge on a high-quality Japanese meal, Nadaman inside the Shangri-La Hotel Tokyo features a Kaiseki (multi-course) dinner with incredible views over Tokyo’s Skyline. 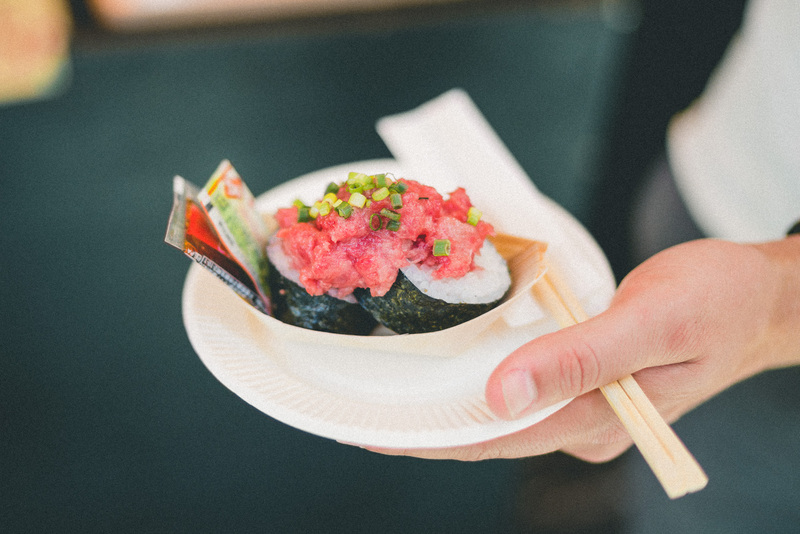 Their sashimi and wagyu beef will melt in your mouth! Tokyo Station – this bustling station is located right next to the Imperial Palace and has the largest amount of trains per day passing through any station in Japan. Sakurai Japanese Tea Experience – this is a modern take on a traditional Japanese tea experience. The owner is a Tea Master who trained for 12 years and traveled around Japan sourcing the best, most flavorful teas to try. 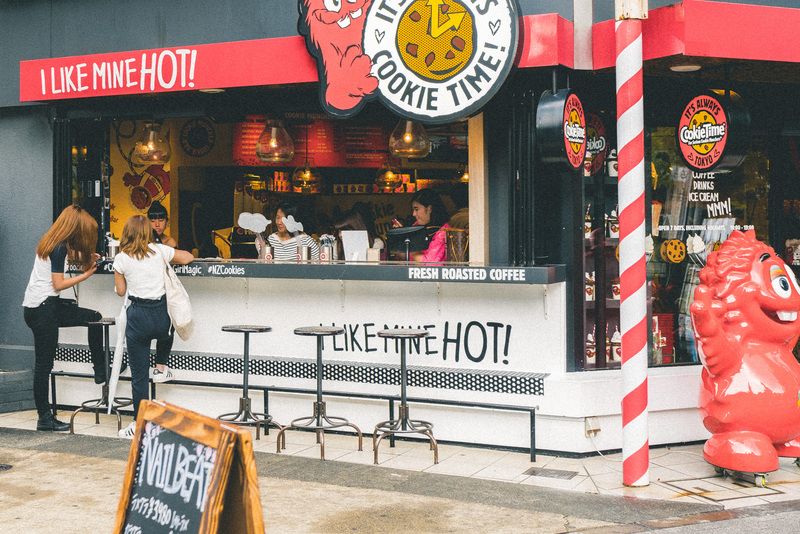 Commune 2nd (Commune 246) – for a trendy outdoor food scene filled with trucks and cafes, head here and come hungry. You’ll also find events hosted in this space throughout the year. Roppongi – for the ultimate nightlife experience, visit Roppongi. It’s popular among the expat community in Japan and always has something going on at any hour of the night. 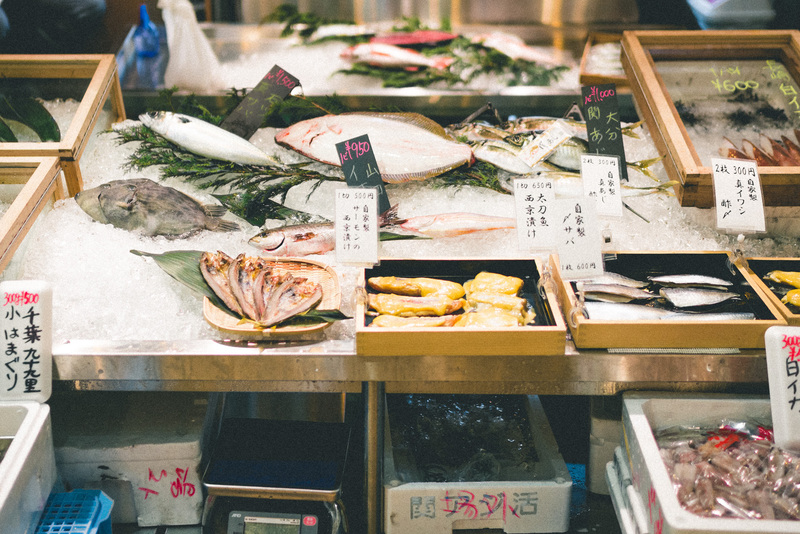 Tsukiji Fish Market – Tokyo’s fish market is the largest in the world and hosts an elaborate array of food stalls, shops, and lots of fish! If jetlag has you up early, you can head over as early as 5am when the local auction starts (you’ll want to chat with a local to determine if you can get in). A sushi breakfast here is a must. Walk-Up Sushi Bar – we did not catch the name of this delicious sushi bar, but it is seriously worth hunting for. You’ll know you’ve found it once you’re looking at a giant tuna design on the wall and a wooden L-shaped bar (here are the exact Google Maps coordinates). And yes, you’ll want to order the tuna! Senso-ji – an ancient Buddhist temple, Senso-ji is the most widely visited spiritual site in the world with over 30 million visitors every year. 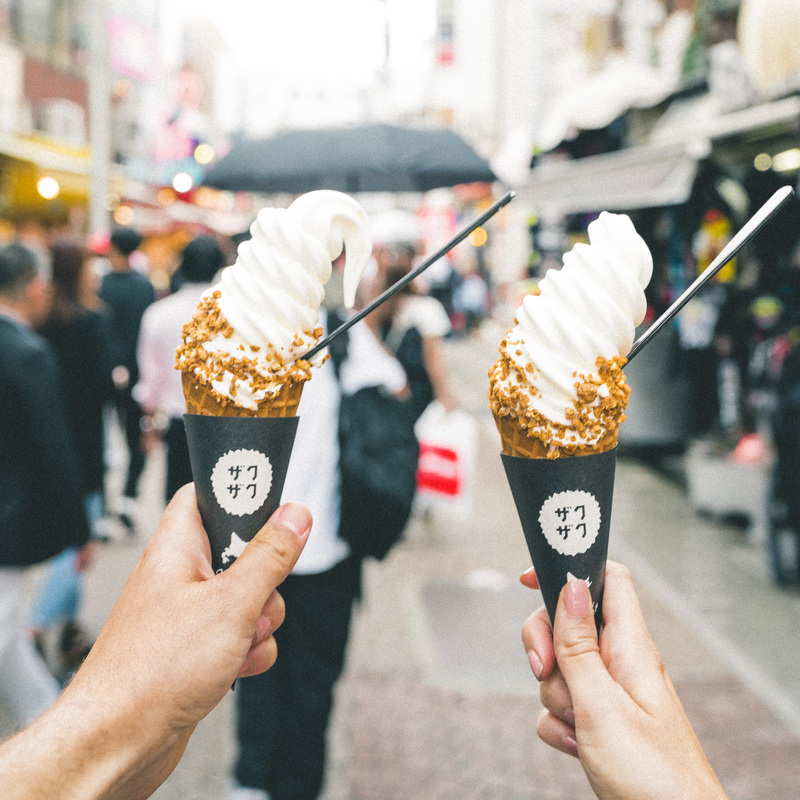 Kappabashi Street – for food lovers and anyone who wants a unique souvenir (Japanese sashimi knife, anyone?) visit “Kitchen Town”, which plays host to a variety of kitchenware shops. Tokyo Skytree Station – for the best views overlooking the city, head to the top of the Tokyo Skytree Station at sunset or in the evening. Edo-Tokyo Museum – this museum features replica of major sights from Tokyo’s past and gives a great overview of the history of the city when it was known as “Edo”. Shiro Hige in Setagaya – this Totoro-themed bakery is as cute as it gets. Daily Chico in Nakano – I couldn’t help seeking out the 8-flavor ice cream cone served here. It’s below a game center, so have your phone ready to ask for directions because it’s fairly hidden! 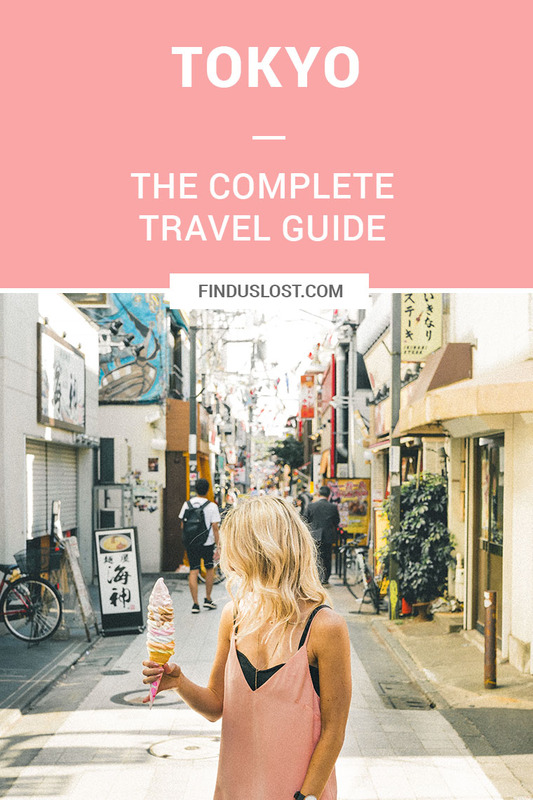 Sakura in Toshima – if you have time to escape the main part of the city, this is an excellent option if you’d like to experience a Japanese bathhouse. 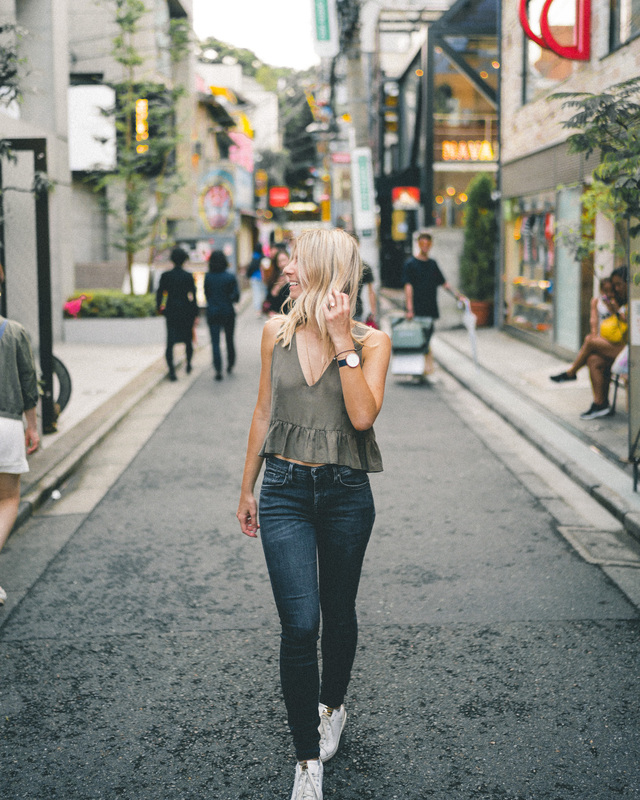 Comfortable clothes – Tokyo city fashion is stylish but practical. Sneakers – you’ll be doing a lot of walking, so bring your favorite pair. An Umbrella – the rain in the city can be unpredictable (we got caught in a serious downpour)! There’s no tipping in Japan! What you see is what you get. I recommend buying a local SIM card at the airport – just make sure your phone is unlocked. Taxis are expensive. You can buy a PASMO train card at your local station. Staff at the help desks speak English and are generally helpful, so don’t be afraid to ask for help if you get lost. Bowing and saying “Arigato” (thank you) goes a long way! Tokyo was an incredible experience, and there is so much to explore in Japan! Combining your trip with another city like Kyoto (above) or Osaka makes for a perfect blend of old and new. 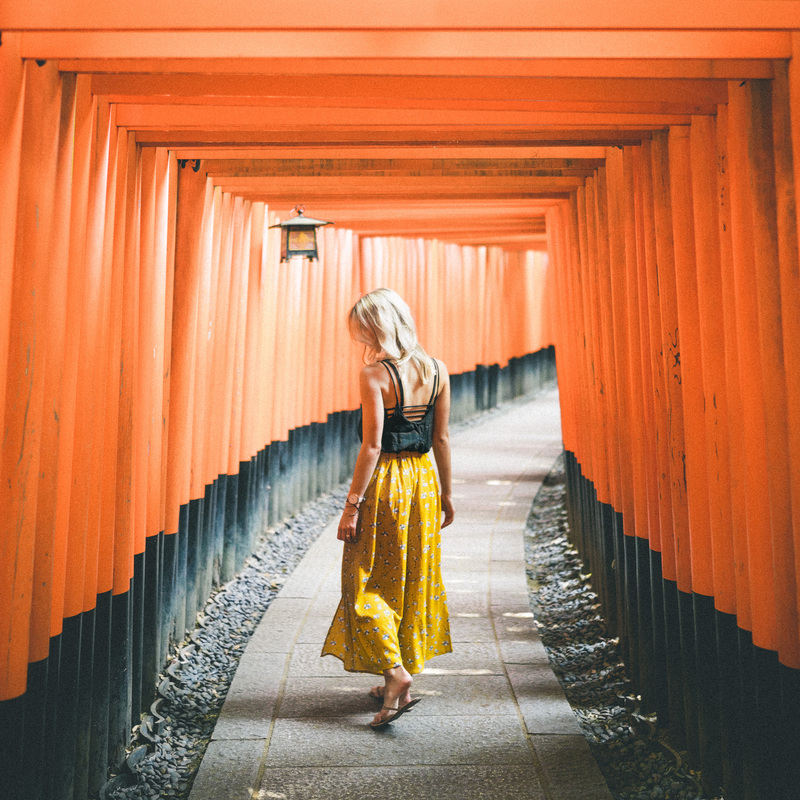 Is Japan on your bucket list? Let us know in the comments below. Great article. Definitely makes me want to visit Japan. Loving all these photos! I’ve been to Japan numerous times and lived there for 2 years but I always love going back to discover more. I’m definitely going to try to get into another trip soon. Just wondering, where did you get your yellow maxi skirt? It’s super cute! Love the post! 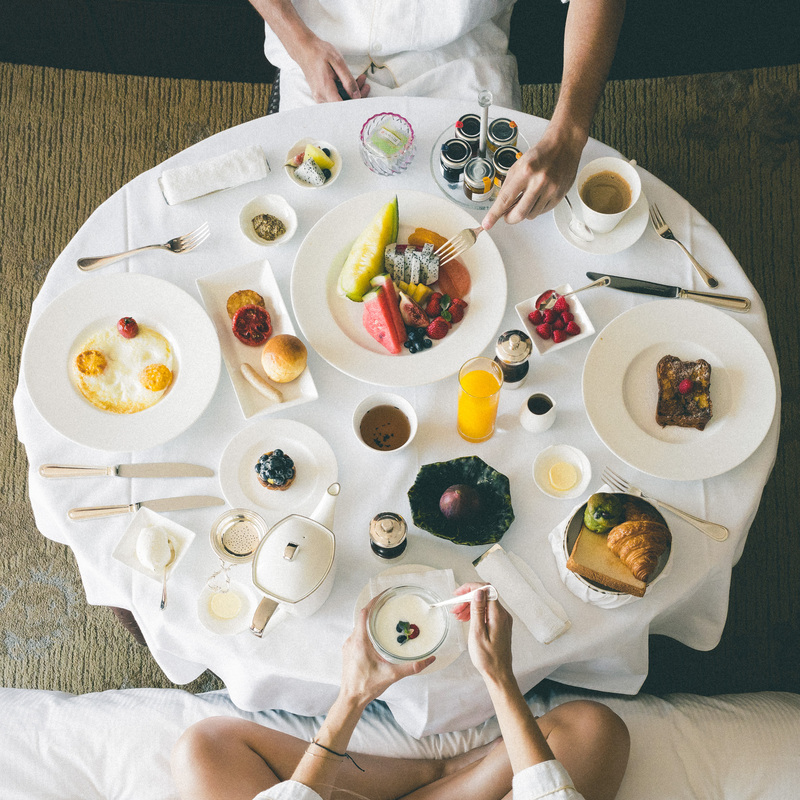 I wonder, how did you manage to make a photo of the breakfast spread from above? Thanks Julia! We took it using our tripod on the bed. 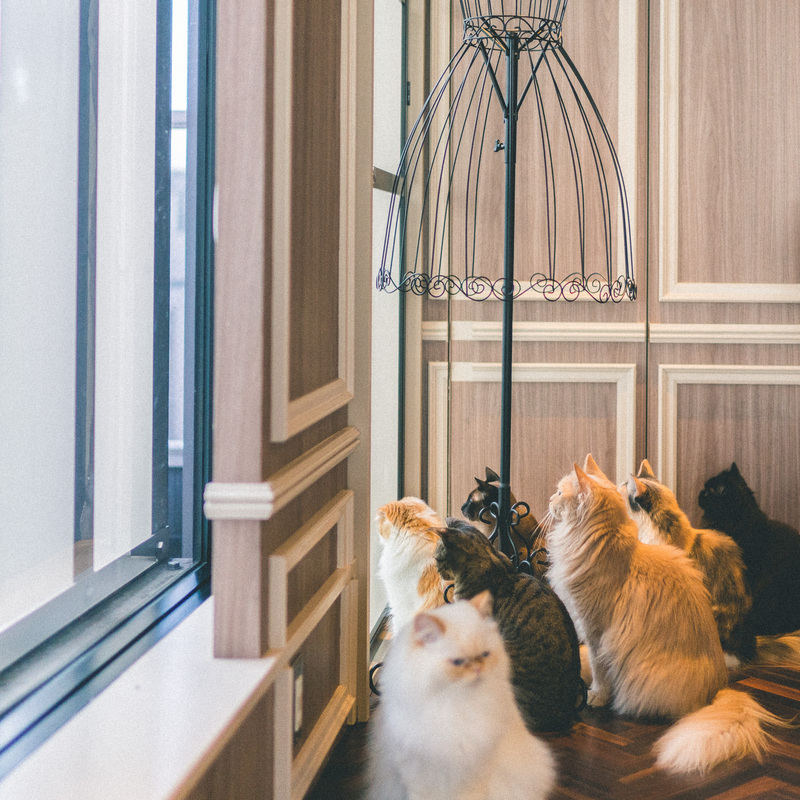 Love the calm tones in that cat cafe photo! ???????? I love this, such beautiful photos!! Do all the rooms at the Shangri-La have a view like the one in your Instagram picture? Or just a specific one? Beautiful pictures!